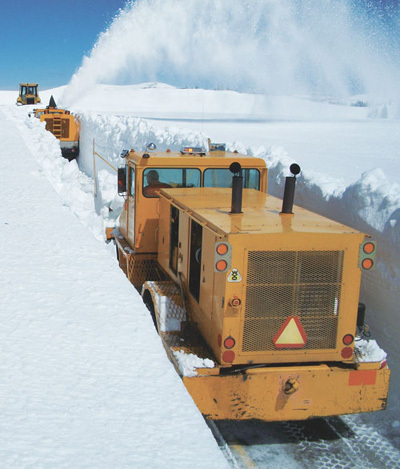 THAT'S A BUNCH OF SNOW! 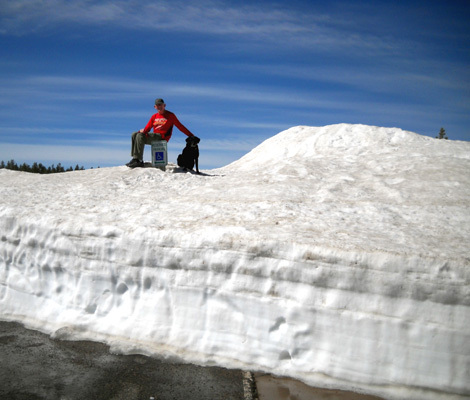 as of Thursday, June 9 for the summer season. . . .
and continuing bouts of winter weather have stymied snow removal efforts ." 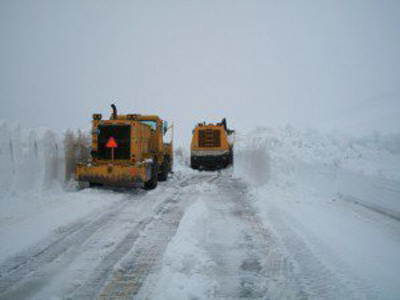 There are some very graphic photos of the deep snow on US 14A as it is being plowed by WYDOT crews recently at the link above and at this one from RivertonRadio.com. 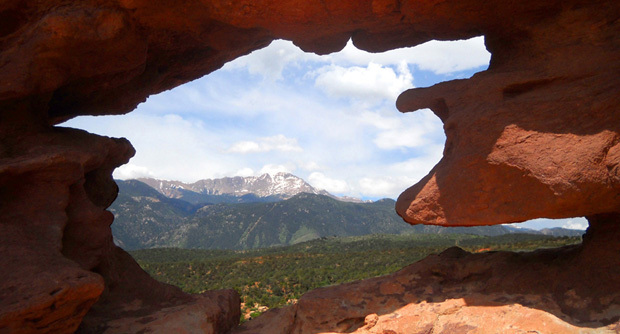 Click on any of the three photos at those links for enlargements. 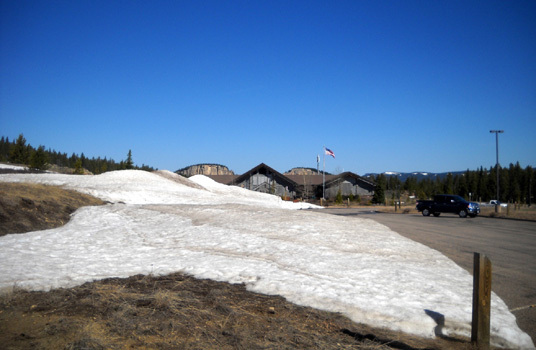 Here's one of the pictures from the Lovell Chronicle site; just look at all the snow!! 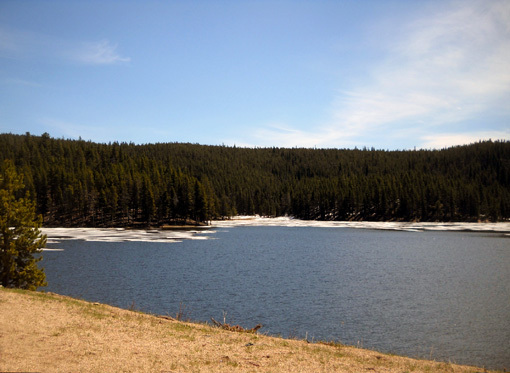 Below is another US 14A photo I found on the internet. It was taken by WYDOT; here's the link to the story dated May 26 about a landslide that further delayed opening this road. That picture shows a little more progress as crews widen one area they've cleared. It looks like they were in white-out conditions that day. The remaining photos are ones Jim and I took today when we drove up US 14 from Dayton, WY to Burgess Junction (26 miles) and beyond on US 14A. 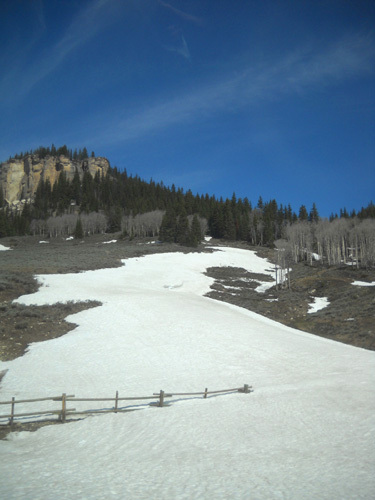 We just had to see what it looks like now, just two days before the Bighorn events begin on Friday. 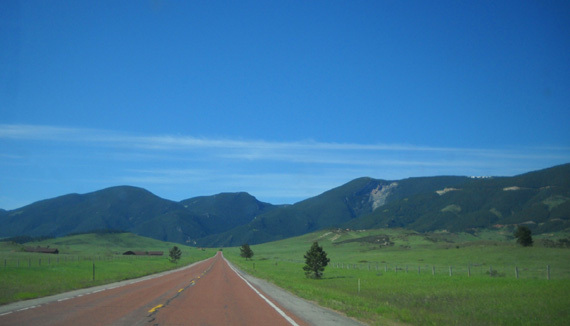 That's what it looks like (above) as we headed west on US 14 from Dayton toward the Bighorn foothills. The campgrounds here and in other places this high are not open yet. We were able to get inside far enough to use the restrooms but the rest of the center was closed for an employee training day. We were hoping to get some verbal information about driving conditions on the forest service roads. Not today. We'd just have to explore on our own. Jim found a "short" sign to sit on. 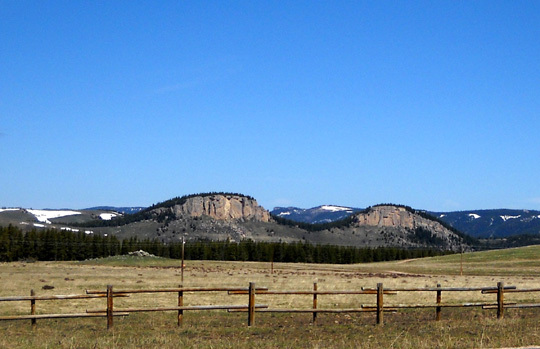 The elevation at Burgess Junction is about 8,100 feet. 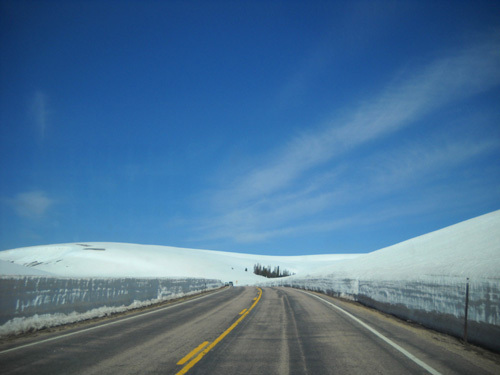 We expected to see more snow on the ground here, but we soon found worse conditions than we could safely drive through. Just past the juncture of US 14 and US 14A we turned north on Forest Service Road 15 toward Dry Fork. The pavement turns to dirt and gravel in less than a quarter mile. This is the road buses take to deliver Bighorn runners to the start of the 30K and 50K races at Dry Fork. It's also the road volunteers and crews must negotiate to access that major aid station used by the 50K, 50-mile, and 100-mile runners. Folks drive several miles on FSR 15, then turn right on FSR 168 for several more miles to reach Dry Fork. Right now it is still in doubt if anyone can get back there by Friday. We went in only half a mile before determining our chances of getting stuck were too high to continue any farther. We don't have 4WD, we didn't have a Verizon signal to call for assistance if we got stuck, and we know it gets worse farther back where sections of the road are in the shade for much of the day. 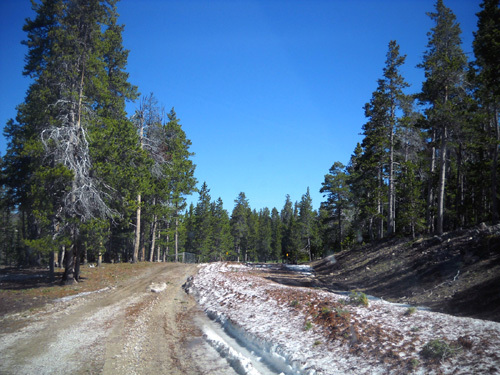 It took Karen Powers and her trail maintenance/marking crew six hours to clear a path wide enough for their 4WD vehicles to access Dry Fork two or three days ago; the Forest Service doesn't have the resources to plow it. 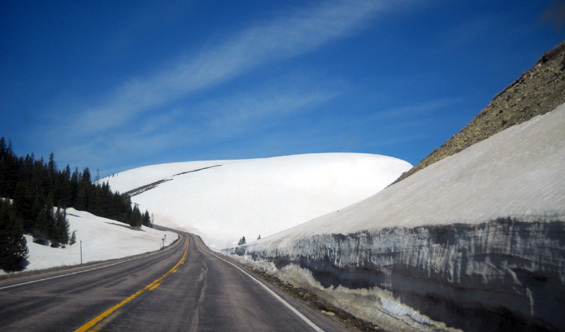 Whether the road will be accessible for the race depends on how much snow melts this week. If vehicles still can't get all the way to Dry Fork by Friday, there is an alternative that hasn't been used before: Twin Buttes. 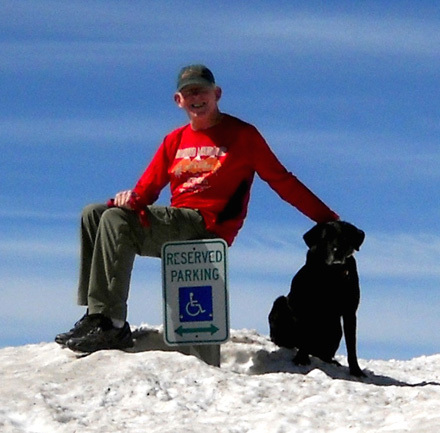 Race officials have already decided there will be a new aid station near the buttes for the 50K, 50-mile, and 100-mile runners on their new super-snow courses. Access is only a few miles back FSR 15 (farther than we went today, but not nearly as far as to Dry Fork). The 30K may also start there. Dry Fork is still on the course for runners, who will just have to go through some snow and mud to reach it. 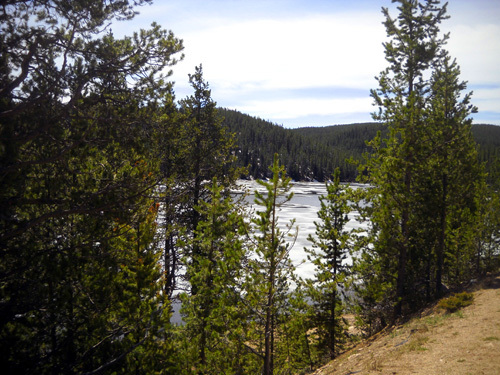 This is the Bighorn Mountain Wild & Scenic Trail Run event, after all! It wouldn't be as much fun if they took all the "wild" out of it. 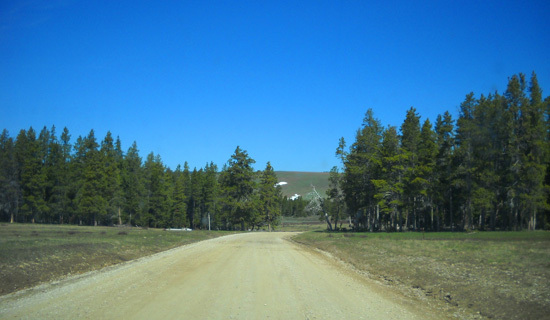 After we turned around we drove back to Burgess Junction and turned west on US 14A, which leads to forest service roads that access other aid stations on the traditional Bighorn courses. I love this drive! The scenery is so beautiful, and it's even more beautiful when there is some snow on the ground. 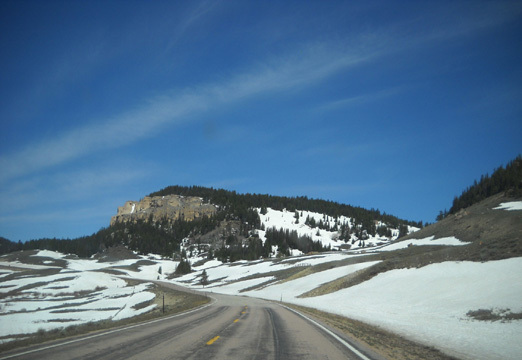 The shots in this section are in chronological order as we drove farther west over what I call the high plateau through the Bighorn Mountains. These are windshield shots I took while Jim was driving. 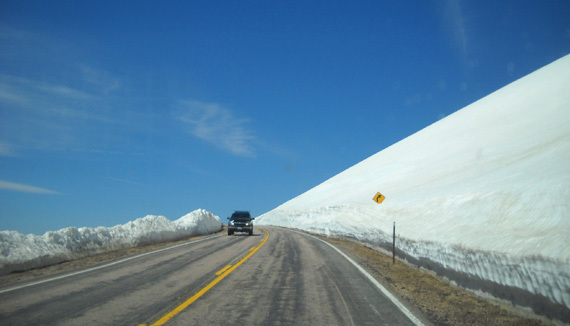 We knew the highway was finally opened last week but we wondered just how high the snow is on FSR 13 to the Porcupine Ranger Station (normally used as an aid station for the 50-mile and 100-mile runners) and FSR 14, which accesses Porcupine and the Elk Camp aid stations. The two roads are fairly close together. 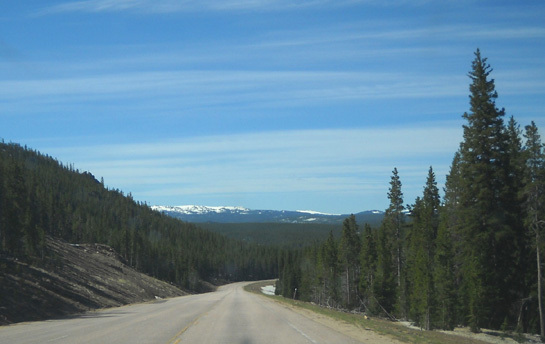 The elevation at their juncture with the highway is at least 1,000 feet higher than Burgess Junction. 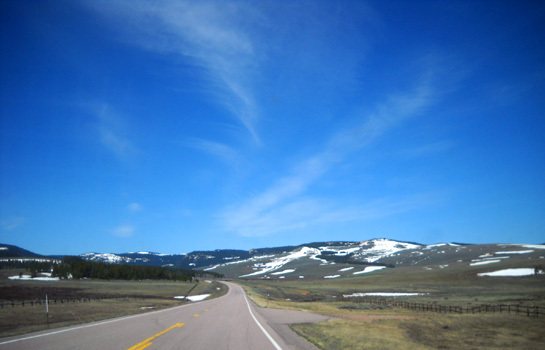 We drove for 20+ miles on US 14A over the gently rising plateau. All of the streams that we could see were running fast and overflowing from melting snow. The road was clear and dry. More photos and narrative on the next page.